Ava Thewes (Clarkston, MI) stopped all 20 shots she faced as the Pursuit of Excellence capped off a perfect season with a 2-0 victory over the Edge School in the 2019 Canadian Sport School Hockey League Female Prep Division Championship Game. This marks the second consecutive Female Prep Division Championship for Pursuit and also their third straight season in the championship game. After 40 minutes of scoreless hockey, Danielle Serdachny (Edmonton, AB) opened the scoring with a power-play marker 2:18 into the third period, while Rachel Weiss (Foothills, AB) sealed the deal with an empty-netter in the closing seconds. Caroline Gosling (Calgary, AB) stood on her head between the pipes for Edge, stopping 48-of-49 shots on the day. Pursuit becomes the first Female Prep team in CSSHL history to post an undefeated season. They went 20-0-1 a year ago. The Canadian Hockey League today announced that St. Louis Blues prospect Joel Hofer of the Portland Winterhawks is the Vaughn CHL Goaltender of the Week for the regular season week ending February 17 with a 2-0-0-0 record including one shutout victory with a goals-against average of 1.00 and save percentage of .967. Hofer claims the honour for the first time this season after turning aside 59 shots in two games last week to help the Winterhawks improve to 36-16-3-3 on the season. Against the Red Deer Rebels on Saturday, Hofer stopped 25 shots in an eventual 2-0 victory en route to first star honours and his third shutout of the season. The following night, he came up with a 34-save performance against the Seattle Thunderbirds in a 5-2 win as he improved to 13-25-2-1 on the season. The 18-year-old Winnipeg, Man., native is competing in his second season in the Western Hockey League. Acquired from the Swift Current Broncos in a January trade, Hofer has notched a .920 save percentage and 2.76 goals-against average in 11 games since the deal. Also considered for the award this week was Jonathan Lemieux of the Val d’Or Foreurs who posted a 2-0-0-0 record in two appearances for a goals-against average of 1.00 and save percentage of .969. In the OHL, Kai Edmonds of the Barrie Colts went 2-0-0-0, stopping 51 shots for a goals-against average of 1.50 and save percentage of .944. The North American Prospects Hockey League (NAPHL) announced its Apex Learning Virtual School Peak Performers for the month of December. The players were selected based upon their performance at the fourth NAPHL event of the season, which took place in Blaine, Minnesota from December 1-3. Stats were based on ALL games played. Jones, 15, recorded seven points in four games during the December event as Pursuit of Excellence went 1-3 during the four games. The 5’8/150 lbs. native of Vernon, BC, recorded at least a point in all four games and had two multi-point outings. He had a hat-trick in a 4-0 win over Nashville and a goal and an assist in a 3-2 loss against Arizona. For the season, Jones is tied for 2nd in team scoring during the 2018-19 season with 10 points in 16 games played. Diaz, 16, had a point in all four games during the December event as Florida picked up two wins. The 5’9/165 lbs. native of Pembroke Pines, FL, had a goal in a 6-4 loss against Arizona, another goal in a 4-1 win over Thunder Bay and assists in the other two games. For the season, Diaz leads all Florida Alliance 18U blueliners in scoring this season with 7 points in 16 games played. Smith, 17, was perfect in both of his starts during the December event, posting two shutouts to help the Kings keep pace among the Elite Division leaders in the standings. During the opening game, the 6’1/185 lbs. native of Thunder Bay, ON, had 13 saves in a 4-0 shutout of the Arizona Bobcats. The next day, Smith made 22 saves in a 3-0 shutout of Shattuck-St. Mary’s. For the season, Smith is one of the top goalies in the 18U Division with a 7-1 record, a 1.13 goals against average and a .929 save percentage. Cameron, 15, helped Pursuit of Excellence pick up three wins during the December event as he recorded seven points. The 5’6/143 lbs. native of Nagano, Japan, recorded at least a point in all four games. His best outing as a two-goal, two-assist performance in a 4-0 win over Florida. For the season, Cameron is 2nd in team scoring this season with 18 points in 16 games played. Pineau, 15, had three points in four games during the December event as the 16U Kings picked up two more wins. The 6’0/165 lbs. native of Thunder Bay, ON, posted a goal and assist in a 3-2 loss against Nashville and had an assist in a 4-1 win over Pursuit of Excellence. For the season, Pineau leads all Kings 16U blueliners in points with 8 points in 16 games played so far this season. Kaner, 15, had two wins during the event in December. The 5’8/150 lbs. native of Calgary, AB, stopped 45 of 46 shots during the event, which was good for a .978 save percentage. In his first game, he made 24 saves in a 3-1 win over Colorado Springs, and in his second game he stopped all 20 shots that came his way in a 4-0 shutout of Florida. For the season, Kaner has a 4-4 record with a 3.10 goals against average and a .909 save percentage. Chunchukov, 15, had four points in four games during the December event, helping Nashville pick up two wins during the trip. The 5’10/160 lbs. native of Hendersonville, TN, had a goal and an assist in a 4-3 overtime win over Everett, the only goal in a 2-1 loss to Arizona, and a goal in a 4-3 overtime win over Colorado Springs. For the season, Chunchukov leads the team in scoring with five points in 12 games played. Bonaldi, 15, had three points during December as the Bobcats stayed in 2nd place in the 15U Elite Division with a 2-2 record. The 5’10/162 lbs. native of Las Vegas, NV, had all three points in one game, which was a one goal, two assist effort in a 5-1 win over Everett. For the season, Bonaldi is 2nd among Arizona 15U defensemen in scoring with 5 points in 12 games played. Gilson, 15, played well in his three appearances during the December event, which included taking on the high-powered Gentry Academy guest team. The 6’0/155 lbs. native of Scottsdale, AZ, made 27 saves in a 2-1 win over Arizona, made 21 saves in a 5-1 win over Everett, and then made 29 on 34 shots against Gentry Academy. For the season, Gilson has a record of 2-2-1 with a 3.98 goals against average and a .888 save percentage. The fifth NAPHL event of the 2018-19 season will take place from January 18-21, 2019 in Detroit, Michigan. It’s a regular Monday morning practice at the Pursuit of Excellence Hockey Academy. Former Kamloops Blazer and director of POE’s female hockey program Kris Hogg, is putting the girls’ class through a little drill Hogg calls. . .
“The triangle of death, you have a triangle up top here and if the puck goes out past those blue lines then the defense has to go skate down the ice,” Hogg said. The feat is a testament to Cherkowski’s hockey skills. Cherkowski who is only 16 years-old, has already verbally committed to play hockey for the University of Minnesota’s Golden Gophers. Now the self-described play maker, has been tapped to wear the maple leaf at the women’s world juniors. “I got to wear the jersey for the first time in the summer, it was an incredible feeling and I can’t wait to do it again.” Cherkowski said. Cherkowski will represent Canada in Japan at the 2019 IIHF U18 Women’s World Championship. “For her it’s big step you know, being able to represent your country,” Hogg said. A step that Hogg sees Cherkowski as ready for. Hogg has worked with Cherkowski for two years and touts her hockey IQ, as one of her biggest strengths. “She is always one play ahead, she is always scanning the ice looking for the next play, so when the puck hits her stick, she is already ready to make that next play,” Hogg said. The U18’s are just the first step to playing at the national level and Cherkowski is hoping that next play for her, might just been an Olympic one. “Definitely the Olympics, that’s the big goal for me,” Cherkowski said. But for now, the 2019 IIHF U18 Women’s World Championship goes January 6 to the 13th in Obihiro, Japan. Thank you to everyone that dropped off gifts for the Salvation Army Christmas Toy Drive. There were quite a few underdog performances to note from last weekend in NCAA Division I women’s hockey play. Defending national champion Clarkson fell to Colgate and Cornell. Previously winless Holy Cross upended Northeastern, snapping the No. 5 team in the country’s 12-game unbeaten streak. 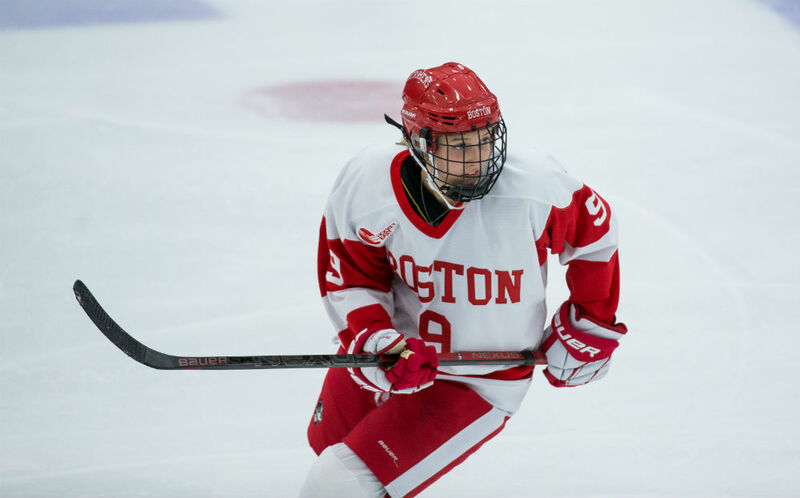 And Boston University, behind a superb weekend-long special teams effort, swept Boston College in a home-and-home series. It might not have been a historic pair of wins, but it was a statement nonetheless for the Terriers, who finished below the .500 mark last season for the first time in a decade. They were slated to finish fifth in the Hockey East preseason coaches’ poll this year, while their crosstown rivals garnered nine of 10 first-place votes. BU held a 4-4-4 record going into the weekend, but knocked off the Eagles with a 3-2 win on Friday and a 4-2 win on Saturday. Goaltending was huge; Kate Stuart and Corinne Schroeder made a combined 79 saves to stave off BC’s offense. But the Terriers’ special teams were in excellent form, too. All three of their goals on Friday were scored on the power play, and they chipped in two more power-play goals in the second game. Defender Abby Cook was responsible for both on Saturday. She scored twice in a seven-minute span on nearly identical plays: well-screened one-timed shots from the point. Her first goal tied the game for the Terriers, and the second gave them a critical lead, which they held onto for the rest of the game. BU’s penalty kill also came up big in the series. The Eagles took a 1-0 lead on the power play in game two, but that was the only power-play goal the Terriers would give up, killing off nine other chances on the weekend. Boston University has had a few down years—they haven’t made the NCAA Tournament since 2014-15, which isn’t quite up to the lofty standards of a program that finished as national runner-ups twice in a three-year span. But BU is always motivated to play Boston College. Even in the midst of a subpar year last season, the Terriers took the Eagles to overtime in the Beanpot final. In the team’s first meeting this season, BU kept it a one-goal game in the 4-3 loss. BU is led up front by sophomore Jesse Compher and junior Sammy Davis, who have 24 and 20 points this year, respectively. No other Terrier has reached double digits yet, so that’s quite a heavy burden for the duo to carry. But last weekend, they got some much-needed goal support from the rest of the line-up. Cook’s two markers from the blue line were key, and both Emma Wuthrich and Deziray De Sousa chipped in with their first goals of the season. Cook is no small contributor to this BU squad. The junior was named a Hockey East First Team All-Star and a New England Division I All-Star last season, finishing tied for 20th in scoring in Hockey East with 26 points and sixth in blocks with 66. This season, she has five goals and eight points, third-best on the team, while continuing to log big minutes. As she takes on more of a leadership role this year, her game plan is pretty simple. Last weekend’s sweep marks the first time the Terriers have won two games in a row against Boston College since a three-game win streak that spanned from Jan. 25 to Oct. 5, 2012. It also marks a pretty clear turnaround for a team that struggled in the first month or so of the season. BU started the year off with a 1-3-3 record, but since Nov. 9 the team is on a 5-1-1 run, with the lone loss coming against the Eagles. That’s helped the team find a renewed sense of confidence. As an athlete traveling on the road, your character is continuously under scrutiny by outside observers that you are not even aware are looking. At Pursuit of Excellence we like to create something called the 360 degree player, meaning developing the players with skills in hockey but more importantly their values in life. Even more than hearing success stories on ice, one thing that gets us most excited is hearing emails like the ones below. "My husband and I ran into a group of your hockey Boys in Roseville Minnesota at the Noodles & Company restaurant on Saturday December 1st. We were so impressed with how these young men carried themselves, all of them dressed in suits; they were so polite and offered us chairs for our table which had no chairs. They conducted themselves like gentlemen they were quietly having fun, being respectful and even wiped off their tables before they left. An impressive program you are running. Hats off to the coaches for being great teachers and role models." "I'm writing to tell you how polite and well-mannered your Hockey Team was on our flight last night from Minneapolis to Seattle. My co-worker's and I were astonished on the difference between your team and the other teams. Please let the young men and their parents know how impressed we were and thank you. GO PURSUIT!" That being said, with so many distractions these days, it can be more challenging than ever to know if a message is getting through to a young man or woman. We'd like to extend appreciation towards our E15 and Midget Prep U18 coaches on doing a great job with these young men and also the players on being a true representation of a 360 Degree Player. If you want your son or daughter to develop similar qualities, please consider enrolling them in POE next season. Click here for more details. Ethan Bear remembers seeing looks of contempt on some people's faces while he was playing hockey. At the time, Bear, from Ochapowace First Nation in southern Saskatchewan, didn't think much of it. "I thought it was just people being rude," Bear said. But as he grew older and started to understand the stereotypes Indigenous people face both on and off the ice, the looks started to make more sense. "You get those looks for sure," he said. "The lazy, not hardworking [stereotype], that's definitely one of them. But that's definitely not the case." 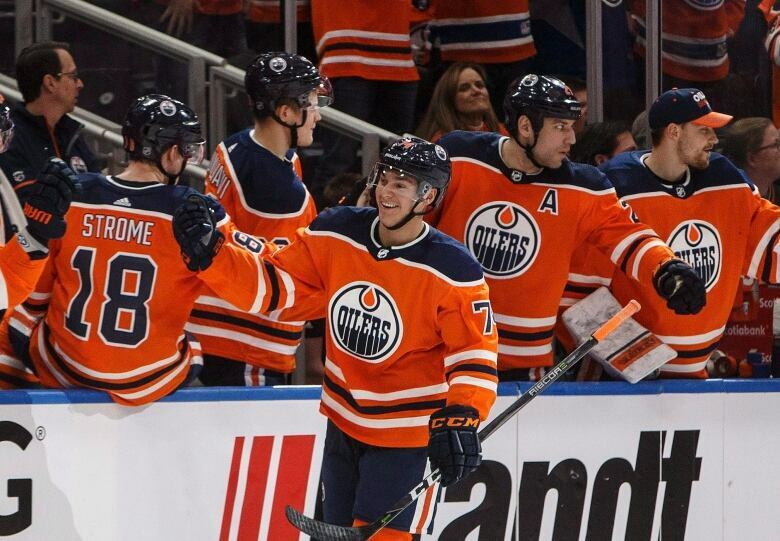 Bear, who turned 21 in June, will start the season with the Edmonton Oilers after he was called up to replace an injured Andrej Sekera. Bear played his early hockey in Ochapowace First Nation in Saskatchewan up until peewee, when he played more competitive hockey in the surrounding communities before heading to Kelowna, B.C., and then Seattle, in the Western Hockey League. A self-described rink rat, Bear found his passion for hockey early on with the influence of his older brother, Everett. The stereotype of Indigenous hockey players being lazy only pushed Bear to be at the rink even more. "I think people put a certain stereotype on us because of the things they don't know or haven't learned yet," Bear said. "You definitely do use it for motivation." He looks up to players like Carey Price, Jordin Tootoo, Arron Asham, Brandon Montour and Michael Ferland — all of Indigenous descent. "You know what the grind is like and what they've gone through," Bear said. "They kind of cleared the path for me." Now Bear is already trying to make a difference at home — he runs a hockey camp in Ochapowace during the summer for youth in the surrounding area. "It's always nice when you're not the only First Nations person out there," Bear said. 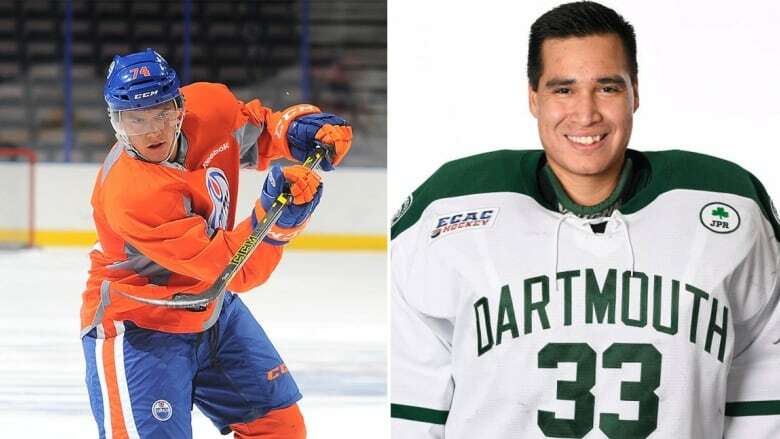 Devin Buffalo, 25, originally from Samson Cree Nation in Maskwacis, Alta., recently signed his first professional contract with the Greenville Swamp Rabbits of the ECHL. 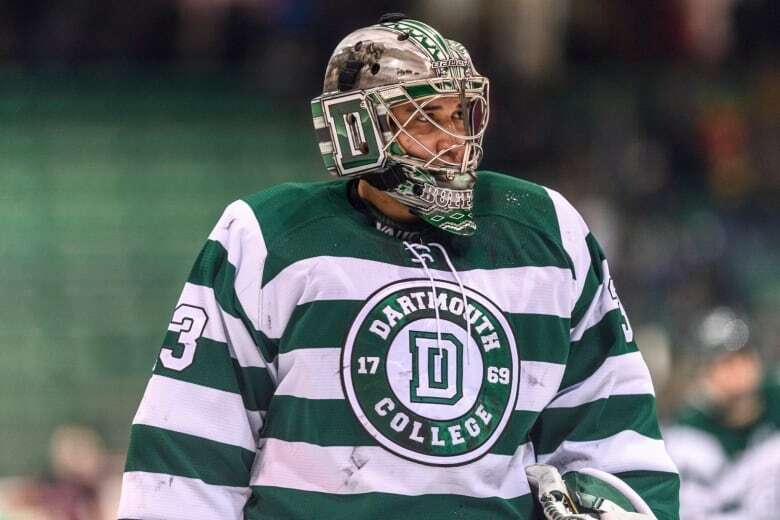 Before signing in South Carolina, Buffalo leveraged his talent as a goaltender into a degree from Dartmouth College, an Ivy League School in New Hampshire. In his final year, he was a finalist for the prestigious Hobey Baker award, given to the NCAA's top player. Goalie wasn't Buffalo's first choice — "I actually hated playing goalie," he said — but his dad gave him goalie equipment and he found himself in the net on his novice team in Wetaskiwin, Alta. Buffalo continued through to bantam but couldn't crack the nearest AAA squad in Leduc. He figures he had a size disadvantage with the other goalies he competed against, but said the stereotype of laziness was always in the back of his mind. "That kind of blankets all Native players to these coaches when you go into these camps," Buffalo said. "I think it is a barrier, but I made it into a positive." Buffalo said Bear's success can be inspiring for many Indigenous youth across the country. "If you see a Native player in Rogers Place on the blueline, it changes everything," Buffalo said. "It starts dreams. That was always my dream — to show people where a Native hockey player could go and overcome these obstacles and stereotypes." As Buffalo worked to surpass those barriers he faced growing up, he in turn paved the way for players like Kaedin Larocque-Wolfe. Larocque-Wolfe, a 15-year-old also from Maskwacis, just cracked the Leduc AAA team, the same team Buffalo struggled to make a few years before. Growing up, Larocque-Wolfe said he didn't face the same types of barriers that other players had. "For people it's different, but it wasn't as bad for me," he said. "Playing in Maskwacis, you did experience some racism here and there in those little towns you went to, just playing against other teams. It obviously didn't make me feel good — it got me mad during games — but I think it just made me play better." The players he looks up to are many of the same cited by Bear, as well as Buffalo. "Just to see a fellow First Nations person playing in The Show, in the NHL, is amazing," he said. And for players like Larocque-Wolfe, who are just starting their adult hockey journeys, looking at the different career paths of players like Bear and Buffalo can provide options — some of which may not have been otherwise visible. Larocque-Wolfe attended the Edmonton Oil Kings WHL rookie camp this year. He also toured some Ivy League schools in Boston, looking at the options in the NCAA. Bear said encouraging fellow Indigenous hockey players is an important part of the battle to curb the stereotypes. "When no one wants you to succeed — it's like that movie Indian Horse, I can relate a lot to that — there's only so much you can do," Bear said. "I think the best thing is to just try to pave the way for others, so it shows that we aren't what they think." Congrats to our Female Prep team on a great start to their season, winning the 15th Annual Stoney Creek Tournament! The Centennials are proud to announce that forward Matthew Kopperud has earned himself a commitment from the Arizona State University Sun Devils. Kopperud is in his second year with the Merritt Centennials and has found some early success scoring 4 goals and adding 4 assists through 7 games. Last season he compiled 9 goals and 8 assists over 40 games played. 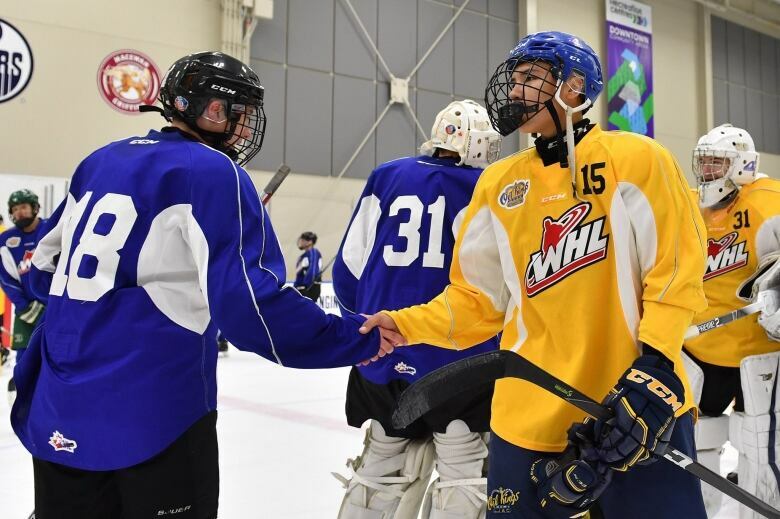 Before joining the Centennials Kopperud spent time with the Pursuit of Excellence program in the CSSHL and scored at a rate of 1.20 points-per-game. Head Coach and General Manager says that despite the early success this year, this pact has been a couple years in the making. POE Alumni TY POCHIPINSKI COMMITS TO COLORADO COLLEGE! A Year End Message "About You"